It might be chilly out here but reading is so much fun we like to read through our lunchtime too. Listen to us learning to play the hand bells. Class 2 have been experimenting with tessellating shapes. We made some fantastic patterns. Class 2 enjoyed using the clay to make caterpillars. We rolled the clay into fat sausages and then joined the ends together using slip to make the body shape. Class 3 visited the library to read the brand new books today. We had a ribbon cutting ceremony to declare the library open and then we got to read the new books. We were all very excited. Watch our fabulous gymnastic skills in action. A great big thank you to Team Activ, Mr Gorner and to Mr Simpson for taking the photos. To mark school's anti-bullying campaign, we all came to school wearing odd socks.This was to show that everybody is different and its ok to be me! In maths, we have been using Lego to help us with our arrays. 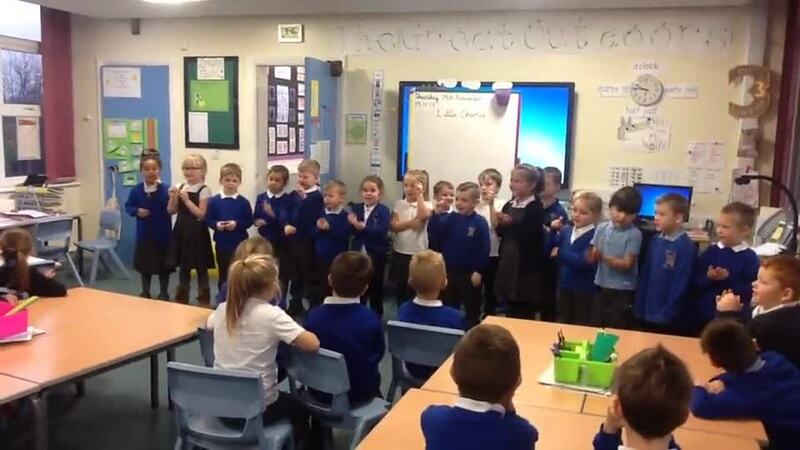 Today year one children went to visit year two children to perform the story of Little Charlie. They did a fantastic job and year two really enjoyed hearing it. Our broad beans have really grown quickly. Today we measured them and checked how much they had grown. Thank you to all the parents who came in to share our learning with us in key stage one this morning. It was great to see you and you really helped us. Class 3 have been developing their hockey skills this week and have been 'trapping' the ball to try to stop people scoring! Class 2 took advantage of storm Hector this week in order to develop and aid our science skills. We made 'wind sticks' to help us see which way the wind was blowing, the used a compass to measure the wind direction. We are now able to say what is different about the weather in summer to the weather in winter. Year 2 have enjoyed their trip to the Roundhouse Library. We had to walk in the rain, cross a busy road and try not to stand in the mud! We each chose a book to read. What fun it was! We had enormous fun making and eating our Bread Tarts in DT. We first made our bread bowls, then chopped up the peppers. After that, we made our fillings - pasta, mayo, ham or tuna and added the peppers. They were delicious! We had a fabulous Christmas Party. We enjoyed our party food, the games and especially our balloon hats! Miss Milner's hat was amazing! KS1 had a great time at the Emergency Services Museum in Sheffield. Although it was cold that didn't dampen our spirits. We enjoyed trying on the clothes and climbing on the fire engine. For the last baking session of the year, KS1 each decorated a biscuit with icing, sweets, edible glitter and lots more besides. They were delicious! Something strange has happened, a dragon has laid three eggs in the woodlands. And that's not all! There was dragon poo, a nest in the trees, an arrow pointing and even a half eaten apple! If you see anything strange please get in touch with Class 2 and 3. We have designed and made our own vehicles in KS1. We made the chassis out of wood and the axle out of wood dowel (which we cut to the correct size using a saw). We glued everything together using cardboard triangles. The top of the car was made from a net. This was tricky as we had to ensure we didn't cut off the tabs so we could glue it together. We then raced our cars. Check out the table below to see how far the cars went! 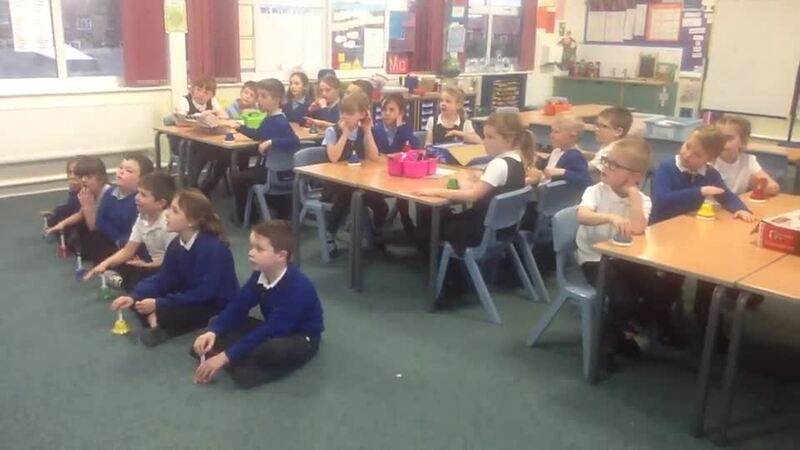 Here in Year 2 we have had a P4C session where we have been talk about the themes from Killer Gorilla. Our question we discussed was "Why was the gorilla called Killer Gorilla?" We had lots of fun making plum crumble! We picked our own plums and apples and took them to the Art Room. We then chopped up the fruit into small chunks, rubbed butter, flour and sugar together with our fingers for the topping then cooked the crumble in the oven. We then ate the crumble with some custard. It was DELICIOUS! Class 2 had to tie knots and work together in Forest Schools today. First they practised tying knots with pencils and string, After that, they went outside and gathered two suitable sticks. Then they had to tie the sticks together to make the top of their natural mobile. It was great to see them working together - well done. Arts week has begun. This year we are taking our inspiration from Ali Baba and the 40 Thieves and lots of different kinds of Islamic art. Keep checking back to see how we get on! We spent a wet afternoon being Grime Busters for a national competition. We filled 6 bags of litter all found in our school grounds. Can you believe it?! Our World Book Day celebrations have begun! We have all brought in our favourite books to share with others in the class. Do you have a favourite book? We have been learning all about the Battle of Hastings. We have used Bloom's Taxonomy thinking dice to create higher order questions to challenge others in the class. In Class 1 we have been learning about eating a healthy breakfast and we have made our own fruit pot. We have learnt how to cut up fruit correctly and safely too. Class 3 have been having fun with suffixes. Can you think of any words that have suffixes? We have been making a healthy breakfast pot for other children to eat. We used different chopping techniques such as the bridge hold and the fork secure, when chopping the fruit. I wonder if you can spot what fruit we have used. Class 2 had lots of fun in the woodland. Can you guess what we were making on the trees? We had lots of fun raising money for Children in Need in our pyjamas! Look at our fantastic maths. We love being able to use our hands and connect the cubes. It was a pleasure to read with Class 1 in the library this week. They read individually and together, and there was some very impressive grapheme spotting going on too. The children have started on their Bar Model journey today in maths. We have been finding out all the different ways a number can be split up. Some of us have even used some algebra to help us! In year 2 we have taken this week's maths challenge. We had to put 5 cubes together in different ways and then work out how much magic paint would be needed to cover all the faces we could see. We used lots of maths skills: counting, adding, multiplying, predicting and checking and understanding of shapes. But most of all, it was fun! We have lol had lots of fun creating seascapes in arts week! 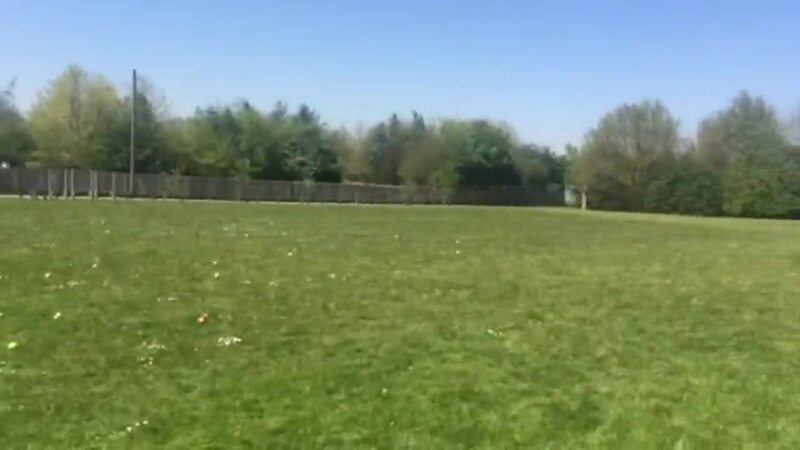 Class 1 had fun doing PE outside in the sunshine this week. We had loads of fun making up our own silly fairy tales. We took different parts of different fairy tales and joined them together! Come back in a few weeks to see our end results. Class 2 and Class 3 have been using the scrap shed resources to explore different materials. We used words like: transparent, opaque, rigid, flexible, strong, smooth, rough, to describe the different materials. We have been learning about 3D shapes in maths. We have made these amazing mega structures. Can you name any of these shapes? Have you ever read Aliens Love Underpants? We have in class 2. We loved it so much we have been busy writing book reviews. why not call in to our class to read the results. We've had a FANTASTIC time at today's Sharing Learning Event in KS1. What a lot of plasticine and what a lot of aliens! Take a look at the photos below. We have been using our imaginations to build space ships and alien planet surfaces! And finally ... There are some finished puppets to admire. In class 2 we have begun to design and make alien hand puppets. Threading needles is a tricky business but we are showing a lot of determination and resilience! We have been learning how to Street Dance in our PE sessions. We have been following a set of instructions to create a dance from start to finish. Check out our best dance moves! We have been experimenting with creating different textures on a plasticine surface. We used our fingers and pencils to create the planets you can see below. Class 3 have been starting to learn the desk bells. Can you guess the name of the song? We had so much fun and learned lots too at the Emergency Services Museum in Sheffield. We need to say a big thank you to John who showed us around, he was brilliant! Thank you to our fantastic mums and dads who came in to help us with our maths this morning, we loved having you to help us. We have been measuring in maths this week. Work has begun on the construction of the chassis of our moving vehicles. Next we will be making the axles. Keep watching! We have been busy making a moving extreme machine in class 2. This week's top singers were picking up conkers ready for the Autumn harvest festival. Class two have been constructing extreme machines that could move on or in water! We showed resilience and resourcefulness to develop our ideas. Some groups even combined their ideas. Well done class2. We have a little warrior in class 2. Watch out, he has just passed his first karate grading and is now a red belt. Look at who has been a reading star! Well done! Here is this week's super singers. Well done you 4 for showing everyone else how to sing like a pop star! Meet class 1s school council reps.
Can you spot our fantastic pirate ships from before the Summer Holidays? We had lots of fun being pirates! Arrrrgh!